When it comes to material, people often gravitate toward 100% cotton, a sturdy, breathable, lightweight fabric that is especially suited for warmer climates. While 100% cotton is oftentimes the better choice, it’s worth considering all of the benefits of a 50% cotton 50% polyester blend before making your decision. A 50/50 blend offers many of the same advantages of 100% cotton, but also avoids some of the pitfalls of the pure blend. Some of the benefits of 100% cotton are shared by a 50/50 blend, but there are a few things that set it apart, and might make it your preferred fabric. Unlike polyester, 100% cotton is hypoallergenic, which makes it an ideal choice for those who experience skin irritation or allergies. If you're purchasing shirts for children, say for a class or for a sports team, you may want to check to see if any of the children have skin allergies before making your decision. A polyester/cotton blend is somewhat breathable, but if the level of breathability is one of the most important things on your list, then 100% cotton may be a better choice. Because the material isn't synthetic, it allows for more air-flow, and is a good choice for very warm climates. However, as we’ll get to in a moment, cotton doesn’t have any wicking properties, so it’s cooler, but perhaps not the better choice if you’re concerned about sweating. While 100% cotton takes a little more work when it comes to proper care (ironing is typically required), it also tends to look a little more professional and makes for a better choice if you’re primarily looking for business attire. A good example would be if you are planning to purchase polo shirts for your employees to wear while at work. For outdoor activities, 100% cotton wouldn’t be as ideal, as it is less durable and doesn’t hold up to sweat as well, but for office use, this pure fabric can have a more professional look than the 50/50 blend alternative. Screen Printing, the process of imprinting a logo or image onto a shirt, can be done with a 50/50 polyester and cotton blend. However, it must be done carefully to avoid color bleeding and ensure a clear image. 100% cotton, on the other hand, will hold the screen printed image better, and is less likely to bleed during the printing process. If you are going to have your logo or image printed on a 100% cotton shirt, the Gildan Heavy Cotton T-shirt is a great choice, as it is heavy weight, and likely to hold up well during printing. There are many instances when you'll want to use a 50/50 polyester and cotton blend over 100% cotton. While it is typically a slightly more expensive fabric than 100% cotton, it makes up for the cost by offering you a more durable, versatile, and comfortable material. Here some of the reasons this blended fabric may be a better choice for your event. A 100% cotton t-shirt has some limitations as to what it is best used for, but this isn’t the case with a polyester/cotton blend. It takes the benefits of both fabrics and combines them into one, making the fabric ideal for almost any purpose. Whether ordering shirts for a sports team or your business or a community event, this material will get the job done. While 100% cotton is a sturdy, beautiful fabric, it is still much more likely to fade than a 50/50 blend. The synthetic fibers in polyester help the material hold it’s color better over time. In short, it will suit your needs really well if you intend to wash the shirts frequently. When it comes to children, unless you're dealing with allergies (as mentioned above), the polyester/cotton blend will have a distinct advantage. Children’s clothing often requires multiple washes, and this blend maintains its color much longer. as you treat and remove stains again and again. If you want a material that’s long lasting, polyester/cotton blends are known for their durability. Just as it won’t fade as quickly, it also won’t lose its shape or come apart as quickly. It’s also less likely to pill over time, meaning it stays looking new longer. We all want clothes that will last, and a polyester/cotton blend offers just that. If you plan to wear and wash your shirt a lot, the blended fabric will be better suited to your needs. Perhaps one of the most frustrating things about 100% cotton is that it is extremely prone to wrinkling. Obviously, wrinkles can be taken care of with an iron and a spray bottle, but most people prefer clothes that come out of the dryer ready to wear. 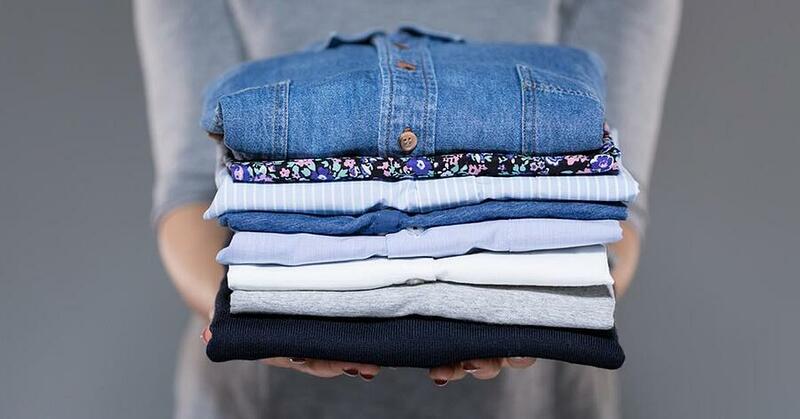 50/50 polyester and cotton is far less likely to wrinkle than 100% cotton, especially if you remove it from the dryer promptly. If you want to avoid the extra step of ironing, this blend is a much better choice. Not only does 50/50 polyester and cotton come out of the wash ready to wear, it’s much easier to wash and care for to begin with. It’s a far less temperamental fabric than 100% cotton, and washes and dries with little fuss. This fabric responds best to being washed in warm water and dried on low to medium heat. 100% cotton must be washed in cold water, dried on very low heat, and will not respond well to being overheated. Stick with the 50/50 blend if easier maintenance is your goal. While 100% cotton is definitely breathable, it doesn’t respond as well to regular sweating and activity. And, as we mentioned, it’s harder to care for, meaning stains are a little trickier to deal with than they are in a polyester/cotton blend. The 50/50 blend is not quite as breathable as 100% cotton, but it makes up for it by holding up well in regular activity, making it an ideal choice for sports and athletics. Polyester has wicking properties, meaning the fabric will dry faster during activities. Shrinking after washing and drying a 100% cotton piece of clothing is a bit of a gamble. However, the synthetic fibers of polyester will keep a blended fabric from shrinking. 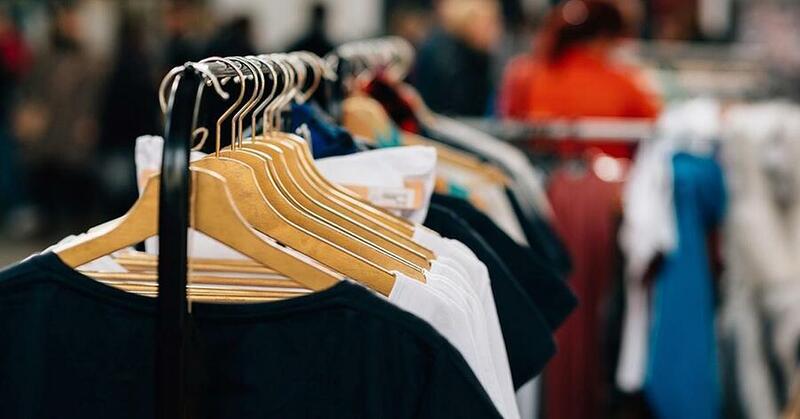 Although you can purchase pre-shrunk 100% cotton clothing, polyester/cotton blends are a little more reliable when it comes to maintaining size and shape. If you’re purchasing t-shirts, you don’t want to be concerned with shrinking, and a 50/50 blend will give you peace of mind that the size you purchase is the size you will continue to have. As mentioned when we talked about 100% cotton, sometimes you want your clothing to have a more professional look, but that’s not always the case. If you’re purchasing shirts for sporty or casual purposes, the polyester/cotton blend will suit your needs well. It’s comfortable and perfect for outdoor and indoor activities of a more casual nature. Jerseys or event tees are a great example of shirts that would look great in a polyester and cotton blend. While it’s true that 100% cotton is the more breathable fabric, that’s not always a quality you’re looking for! If you need material that's going to keep you warmer, the polyester and cotton blend provides the comfort of the natural cotton feel with the warmth of the synthetic polyester. Not all activities take place in the winter, or in warmer climates. This blended fabric will be a better choice for you if you need something that breathes but isn’t going to leave you wet and freezing after your activity. 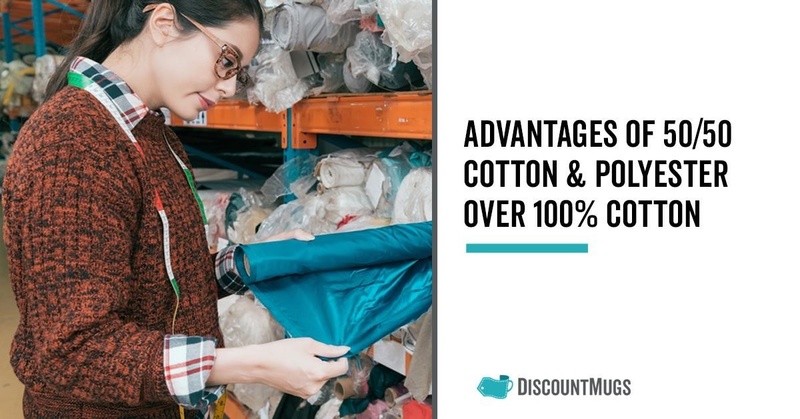 In certain cases, 100% cotton is a better choice than a 50/50 polyester and cotton blend, but as you can see, the blend holds many advantages over 100% cotton. When choosing a fabric for your needs, take all of these things into consideration and you may find that the blended fabric is exactly what you were looking for. Whichever fabric you prefer, you can find great, affordable shirts to meet your needs at Discount Mugs.